View of the cool underworld of Wendelstein 7-X: More than a kilometre of piping of diverse diametres was installed for the cooling system (photo: IPP, Anja Richter Ullmann). A function test now marks successful completion of the water cooling system for the Wendelstein 7-X fusion device at the Greifswald branch of Max Planck Institute for Plasma Physics (IPP). 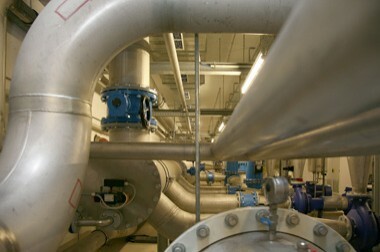 After tendering from all over Europe, the EUR 4.8 million large-scale contract for the complex system comprising numerous pumps, pipelines, fittings, heat exchangers and filters was awarded to a company in Greifswald.